NOTIFICATION No.SI.2-2/2018 by a government of the Punjab, services & general administration department section (services-I) Lahore the 23rd November 2018 regarding New Secretary Education Punjab Fully Charged School Education Department. MR. Zafar Iqbal. (PAS/BS-20) awaiting posting in Services & General Administration Department, Government of Punjab is hereby posted as Secretary to Government of Punjab. Schools Education Department, with immediate effect, against a vacant post, relieving Mr. Ghulam Farid (PAS/BS-19). Special Secretary (Operations). Schools Education Department. A government of Punjab, of the additional charge of the post. 2. 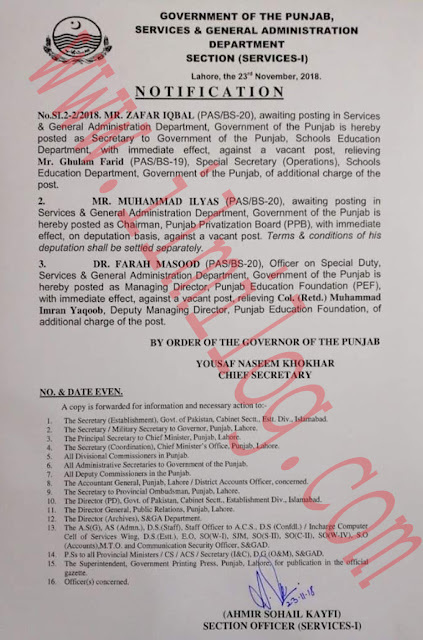 MR. MUHAMMAD ILYAS (PAS/BS-20), awaiting posting in Services & General Administration Department, Government of Punjab is hereby posted as Chairman, Punjab Privatization Board (PPB). With immediate effect, on deputation basis, against a vacant post. Terms & conditions of his deputation shall be settled separately. 3. DR. FARAH MASOOD (PAS/BS-20), Officer on Special Duty. Services & General Administration Department. 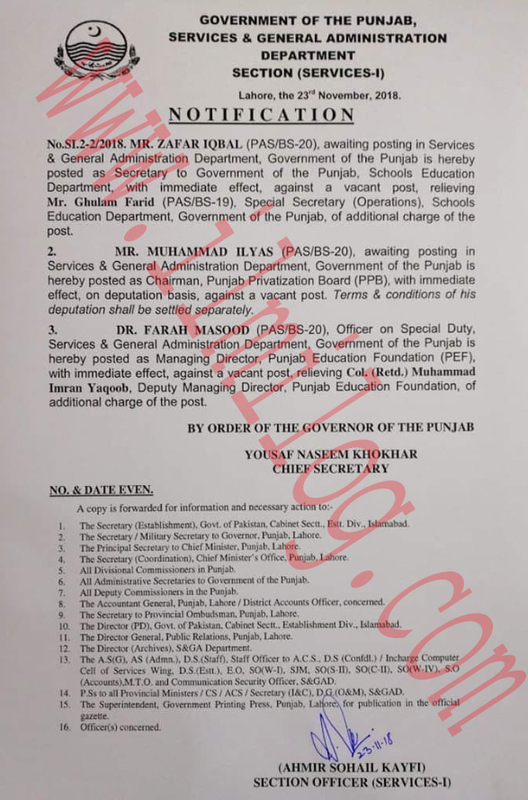 A government of Punjab is hereby posted as Managing Director, Punjab Education Foundation (PEP), with immediate effect, against a vacant post, relieving Col. (Retd.) Muhammad Imran Yaqub. 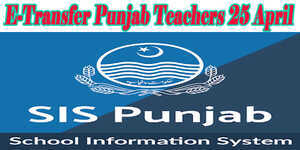 Deputy Managing Director, Punjab Education Foundation, of an additional charge of the post. O. 8; DATE EVF.N. A copy is forwarded for information and necessary action to - The Secretary (Establishment). (Loss of Pakistan. Cabinet Scott. Div... Islamabad. 2 The Secretary/ Statist). SMIC1311 y to ("manor. Punjab. Lahore 3. The municipal Secretary to Chief Minister. Punjab. Lahore 4. The Secretary (Coordination, Chief Minimum'. Office. Punjab. ! Allen 5. All Divisional commissioners in Punjab 6. All Additional Secretaries government of Punjab. 7. All Deputy Commissioners in Punjab. S. The Accountant General. Punjab. / District Accounts 9. The Secretary to Provincial Ombudsman. Punjab.. 10. The Director (PD) government of Punjab. Cabinet Seen... Establishment Div... Islamabad. The Director Genoa/. Public Relations, Punjab, Lahore. 12 The Director (Archives). S/CGA department. 13 The A.S4G). AS Admin 1. 17. S (Staff). Staff Officer to A.C.S... D.S / Computer Cell of Services Wing.